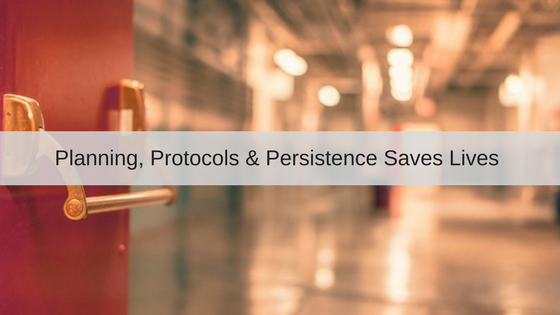 Protocols, training and persistence saved the lives of countless children at Rancho Tehama Elementary School in Corning, California. Another lunatic gunman began selecting seemingly random targets to kill in an apparent psychotic rage. He eventually set his sights on entering the elementary school at the Rancho Tehama Reserve but that attempt was thwarted by the simple yet effective decision to place the school on lockdown. In the active shooter incident at Columbine High School, not a single locked door was penetrated by the shooters. Further proof that something so simple can be so effective during an active shooter incident. These gunmen typically come prepared to create the maximum amount of carnage with a large amount of ammunition and weaponry. However, they typically do not come prepared, physically or mentally, to breach locked or fortified doors. I often reiterate that these active shooters seek maximum carnage AND MINIMUM RESISTANCE. The gunman in this case met immediate resistance at the school and immediately chose another path for his rampage. Faculty members reported hearing gunfire approximately a quarter mile away from the school and immediately took action. Their training and protocols instantly took over and allowed their brains to process the noise as gunfire instead of fireworks as is so often the case. Many times our brains immediately try and process certain stimuli from our environment as something familiar and safe instead of processing it as something more sinister and unsafe. What allows our brains to process these things correctly is training and planning in advance. It is very difficult, if not almost impossible, for our brains to recall anything complicated during a critical incident. Simply put, our stress response won’t allow it. However, previous planning and training allows us to overcome several of our bodies’ stress responses during a traumatic event. This is exactly how police officers and soldiers are able to operate successfully in the most critical and traumatic situations. Many times they do not have time to think, they must simply respond to whatever they are faced with instantaneously with no time to process what they are seeing, hearing or feeling. I cannot reiterate this enough: ALL schools, churches, and businesses need to have a plan to deal with critical incidents and potential intruders. Having a plan is a phenomenal start, however you must also PRACTICE that plan. The goal is to practice it enough that your brain and your body will both respond to an event instead of simply reacting. A response is typically pre-planned where a reaction is simply a moment in time reflection of what your brain is processing at that moment. In today’s world of lunatic psychopaths gunning down multiple random victims, it is time to shift our focus. Instead of trying to predict the where and when of the next attack, we must focus on hardening potential targets as well as a implementing a planned response. We would all love to have a solution to stop the next mass casualty incident but we all know that is not the reality. These attacks will undoubtedly continue and we all have a responsibility to focus more on the safety and security of our schools, churches, homes and businesses. To learn more about obtaining a security evaluation, training for a critical incident, or strengthening the security of your school, church, or business, please visit our website at www.defendsystems.com or give us a call at 615-236-6484. We are passionate about helping all organizations achieve real security. One historical fact about 2017 is that it was a grim reminder that active shooter and mass casualty incidents are on the rise in America. The staggering number of casualties, the vast amount of locations, and the varied motivations of the attackers are all reasons that our mindset as a society should be changing. It is still unthinkable to believe that enough evil exists inside some people to commit these heinous acts, but the seemingly endless news cycle of violence remains a stark reminder that there are truly evil people among us. In the aftermath of every active shooter and mass casualty attack, most people immediately search for a motive and become hyper-focused on determining the “why”. The truth is this, active shooters and terrorists all have varied motivations and triggers and attempting to determine what these are for each incident will not prevent the next tragedy. Beyond the increasing number of attacks and the vast number of victims during the last year, what is even more alarming is the number of different locations where these incidents occurred. Eugene Simpson Stadium Park, Alexandria, VA – A lone gunman opened fire on lawmakers and aids who were participating in a baseball practice in preparation for an upcoming charity game. Capitol police officers assigned to a security detail for Representative Steve Scalise returned fire and engaged the gunman. Two Alexandria Police officers also arrived and continued to engage the suspect in a gunfight that lasted roughly ten minutes. The suspect was shot by police and later died at the hospital. A total of four victims were shot by the gunman, all of them survived. Aztec High School, Aztec, NM – A 21-year-old former student gained access to the school by disguising himself as a student during normal student arrival. He wore a backpack which contained a 9mm handgun and made his way to the bathroom to prepare for his rampage. After classes began he exited the bathroom and shot and killed two students. The school went on immediate lockdown and his access to other students was thwarted. The shooter then took his own life. Bronx-Lebanon Hospital, New York, NY – A former doctor and ex-employee of the hospital, armed with an assault rifle, opened fire on the 16th and 17th floor of the facility. The gunman killed a doctor, wounded six other people, and attempted to set himself on fire before turning the gun on himself and taking his own life. UPS Facility, San Francisco, CA – A disgruntled employee armed with two pistols began shooting his coworkers during a morning meeting at the facility. The gunman killed four people and wounded two others before being confronted by police at which time he took his own life. First Baptist Church, Sutherland Springs, TX – A single lunatic gunman opened fire on churchgoers who were attending Sunday morning services. The gunman was eventually confronted and shot twice by a neighbor to the church as he was fleeing. The suspect fled in his vehicle and eventually crashed at which time he shot himself in the head. The suspect killed 26 people, ranging in age from 18 months to 77 years, and wounded 20 others in his rampage. A total of fifteen empty magazines were located inside the church, each of which had a 30 round capacity. Fiamma Awning Company, Orlando, FL – A former disgruntled employee entered the business through a back door armed with a handgun and a large hunting knife. He began shooting several former co-workers with most of them being shot in the head and some, multiple times. Police arrived within two minutes and prepared to enter the building at which time the suspect shot himself. A total of five people were shot and killed during the attack. Route 91 Harvest Festival, Las Vegas, NV – A lone gunman hell-bent on executing as many innocent people as possible, opened fire from his 32nd-floor hotel room that overlooked the Route 91 Harvest Festival. Utilizing several rifles and magazines, he shot indiscriminately into the crowd of concertgoers killing 58 people and injuring 546. The shooter fired over 1,100 rounds during the attack and ultimately committed suicide as police officers closed in on his location. These seven incidents are fundamental examples of why EVERY organization should be training to deal with an active shooter or mass casualty incident. These cowardly attacks have no bias or consistent methodology as to the location or targeted victims. Every shooter has a different motive or perceived reason as to why they rationalize their actions and they typically PLAN TO DIE. The truth is this, it can happen ANYWHERE, ANYTIME and to ANYONE. What’s your plan? To learn more about improving your physical security, training for a critical incident, or obtaining an evaluation for your school, church, business, or home, please visit our website at contact us or give us a call at 615-236-6484. We are passionate about helping all organizations achieve real security. Fearing attacks, firms install sensors to track, help neutralize active shooters; systems’ true purpose often masked for fear of sparking a panic. Corporate executives worried about workplace shootings are quietly installing gunfire-detection systems in U.S. offices and factories. Most don’t tell employees what the sensors are, for fear of alarming them. The rapid uptick in adoption of gunshot sensors follows a wave of workplace shootings in the past year. The latest occurred Friday when a man opened fire at an Aurora, Ill., factory following his termination, killing five co-workers and injuring five police officers. Deadly incidents in recent months include shootings at the California headquarters of YouTube, in the lobby of Fifth Third Bancorp in Cincinnati, at a Maryland newspaper and in a Florida hot-yoga studio. The sensors blend in to walls and the ceiling, and look similar to fire-safety equipment. “I’ve told people they’re air-quality sensors before and they don’t even second guess it,” Mr. Terry said. Originally developed for the battlefield, many sensors use a combination of acoustic and infrared technology to “see” the flash of a gunshot while also hearing it. The systems can be wired to alert police and instantly send texts, calls and desktop notifications to employees, flashing messages to tell workers how to respond in an emergency. Once the sensors detect a gunshot on a floor, the devices can track a gunman—integrating with camera systems—as he moves through a building, in theory allowing police to zero in faster and neutralize the threat. One reason many companies don’t explain to employees what the devices do is that they fear somebody will try to test them out by bringing a gun to work, security experts said. Gunshot detectors now exist in employee cafeterias, meeting rooms and distribution centers, among other locations. Toyota Motor Corp. installed them at an auto plant in Kentucky. Pharmaceutical giant Allergan PLC and Corona beer maker Constellation Brands Inc. have put gunshot-detection systems at some offices and facilities. An Allergan spokesperson said employee safety is a priority and the detection system is “one part of our multilayered security platform that helps us respond to situations quickly.” Constellation Brands declined to comment. At Saks Fifth Avenue’s flagship store in New York, the devices are perched over beauty and jewelry counters. In 55 Water Street, one of the largest office buildings in Manhattan and home to S&P Global Inc. and Hugo Boss, about a dozen sensors are scattered through the lobby and beside an escalator, said Scott Bridgwood, vice president of operations for New Water Street Corp., which manages the building. The cost, so far, has been less than $100,000, and Mr. Bridgwood said he hopes to have the devices on every floor at some point. He sees tremendous benefits to having the technology widely deployed and linked to local authorities to hasten response times. The Charleston, S.C., airport put gunshot sensors near ticketing and baggage-claim areas. “I’d rather be prepared and not use it than need it and not have it,” said Paul Campbell Jr., chief executive of the Charleston County Aviation Authority. The sensors cost around $1,200 each, and big employers can spend anywhere from $10,000 to hundreds of thousands of dollars on the systems. Many more major corporations have purchased the devices recently, The Wall Street Journal found. Some security advisers question whether money spent on gunshot detectors could be better used on more robust active-shooter training, assessments to determine gaps in building security, or physical barriers, such as door locks and ballistic glass, to deter a shooter. While building codes mandate lifesaving equipment such as fire alarms, no such regulation exists for gunshot detectors. Indoor systems are still new enough that many law-enforcement experts remain unfamiliar with them, and research on their effectiveness is limited, says Ronal Serpas, a professor at Loyola University in New Orleans, and the city’s former police superintendent. Shooter Detection Systems LLC is among the biggest sellers of the systems and has more than 18,000 devices deployed. Chief Executive Christian Connors says the company has never had a false positive, thanks to years of refining the product, which is based on technology developed in the 1990s by the U.S. Defense Advanced Research Projects Agency, also known as Darpa. The sensors can distinguish between a gunshot and a car backfiring, firecracker exploding or balloon popping because they listen for the specific signature sound of a muzzle blast, he said. Sales at Shooter Detection Systems are up 400% in the past year, with Fortune 500 companies now representing the firm’s biggest base of clients, Mr. Connors said. He declined to name the firm’s customers. Public records show that the Georgia Institute of Technology in Atlanta spent more than $200,000 in 2018 to put 95 sensors from Shooter Detection Systems across its campus, including the cost of installation, cabling and software. More schools have been eyeing the technology, but some feel if they install them in one building, they must install them in all, security experts say, a stipulation that may prove cost-prohibitive. Mr. Connors said his company will soon introduce a package of sensors priced below $10,000 for schools. Tennessee church shooting leaves one dead, several wounded, officials say. That was the headline on Sunday, September 24, 2017. According to police the masked gunman shot and killed one female in the parking lot and then entered the sanctuary where he began shooting people indiscriminately. One Church member, a 22 year old usher, was able to respond by physically confronting the gunman, during which, the gunman received a self-inflicted gunshot to his chest. That member then went to his car in the parking lot, retrieved his own weapon, and headed back into the church where he held the suspect at gunpoint until police arrived. Clearly things could and would have been much worse if not for the heroic and selfless action of that young man. At this point we don't know what motivated the gunman to carry out this heinous attack. However, does the “why” really matter? The answer is no. We could spend days and days trying to figure out why these happen and trying to predict when and where another one may occur, only to come up short. We all have to go beyond asking ourselves why and adjust to the reality that these types of mass casualty incidents are on the rise and we have to accept the fact that we must do something to prepare for them. HERE ARE FIVE THINGS THAT EVERY CHURCH SHOULD DO TO IMPROVE THEIR SECURITY. 1) Form a security team. Hopefully your church already has some sort of security team but if not, now is the time more than ever. More than likely these crazed gunmen are not going to target the large mega church that has three uniformed police officers sitting outside. They likely select their targets based on their ability to carry out as much carnage as possible. Having an obvious and visible security presence is critical. 2) Get a threat assessment and security evaluation done for your particular facility. Every church building and property is different and will have different strengths and weaknesses when it comes to achieving physical security. Hiring a professional to evaluate your facility can make all the difference when it comes to critical incidents. 3) Develop plans and protocols. Your team needs specific plans and protocols in place to be truly effective. Every man for himself is not a plan. What are the preventative measures and protocols going to be and who is responsible for them? What are the teams’ specific roles should an intruder enter the building? These are all things that need to be nailed down in advance. 4) Conduct training. Training and repetition is what makes soldiers and police officers so effective at their respective jobs. They face situations daily where they must take decisive action immediately upon encountering a threat when there is no time to stop and think. They do this by relying on their training so that when the time comes they don’t simply react, they respond. 5) Be vigilant and consistent. Do not take for granted that another member of your team has already checked the south parking lot, or has secured a particular door, etc. Do not get complacent about your plans and protocols. Consistency can save lives, complacency kills. If you want to learn more about strengthening the security presence at your church or business, go to our website or give us a call at 615-236-6484. We are passionate about helping organizations achieve real security in this dangerously developing world.